Sometimes it takes a special performance to defeat Laura Asadauskaite (LTU) and that is exactly what Tamara Alekszejev (HUN) produced to win the UIPM 2017 World Cup Women’s Final. 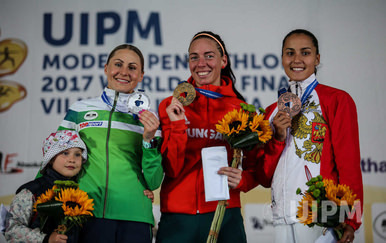 Alekszejev (HUN) had never previously finished on the podium at a major individual UIPM competition but her gold medal was fully deserved after a flawless performance. At the end she described it as the “perfect” day. It was very nearly a perfect day for Asadauskaite (LTU) and the loyal, passionate crowd who braved wet weather at Vingis Park to support their national hero, the London 2012 Olympic champion. They created an incredible atmosphere as the 33-year-old Asadauskaite set off in the Laser-Run with a deficit of 77 seconds to make up on Alekszejev (HUN), who started with a 23-second lead over Kim Sunwoo (KOR). 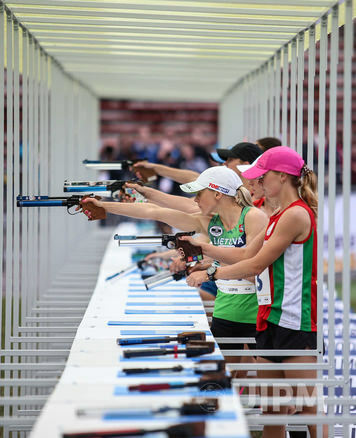 Asadauskaite (LTU) is renowned for her exceptional Laser-Run and the crowd knew they were in for a treat as she started advancing through the field. When she left the range for the final time after a flawless set there seemed a real possibility that she could create a fairytale finish. As it was, Aleksejev (HUN) kept her composure under real pressure to seal a career-defining success. “I feel perfect. I can’t believe I’m World Cup champion. I’m very happy,” said Alekszejev (HUN), whose compatriot Sarolta Kovacs (HUN) finished 7th. At the end Asadauskaite (LTU) was the centre of attention as locals flocked to congratulate her – and she was joined on the podium by her daughter Adriana, 7, before they posed for photographs together. Behind the leading duo there was a dramatic sprint for bronze and it was Gulnaz Gubaydullina (RUS) who held off the challenge of Anastasiya Prokopenko (BLR) to secure the medal. Prokopenko (BLR) timed 11:41 in the Laser-Run, almost as quick as Asadauskaite (LTU, 11:35). Kim Sunwoo (KOR) took 5th after a consistent performance and Gloria Tocchi (ITA) was the final prize winner in 6th. Earlier, Gubaydullina (RUS) was typically slick in the pool with her best Swimming time of 2017. She easily won the final heat in 2:07.76, ahead of Kovacs (HUN, 2:10.45) and Ieva Serapinaite (LTU, 2:12.84). The Fencing Bonus Round at Vingis Park featured three exceptional performances. First Kate Coleman-Lenehan (IRL) climbed up from the bottom of the ladder with six victories, before Volha Silkina (BLR) added five of her own. The best was reserved for Tocchi (ITA) who won nine bouts in a row. 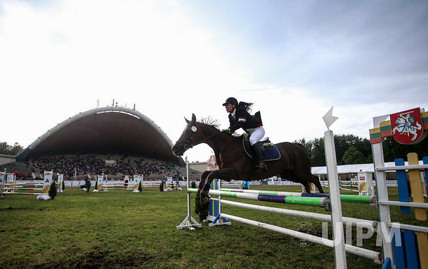 The rain had come in torrents and showers for much of the day and the wet grass cut up under the hooves of the horses but performances from both horse and athlete were excellent in the circumstances, and there were seven scores of 300. Akekszejev and Kovacs (HUN), Tocchi (ITA) and Lina Batuleviciute (LTU) were among those with a flawless score while Asadauskaite (LTU) dropped just seven points, a penalty that would not prove crucial in the end. UIPM President Dr Klaus Schormann said: “Today we were treated to a very exciting finish, especially with Laura coming from behind with such incredible support from her public and her fans. The Mixed Relay will conclude the 2017 World Cup season tomorrow (June 25). Eurosport 2 will broadcast the final stages of the competition "as live" at 9.45pm CEST. 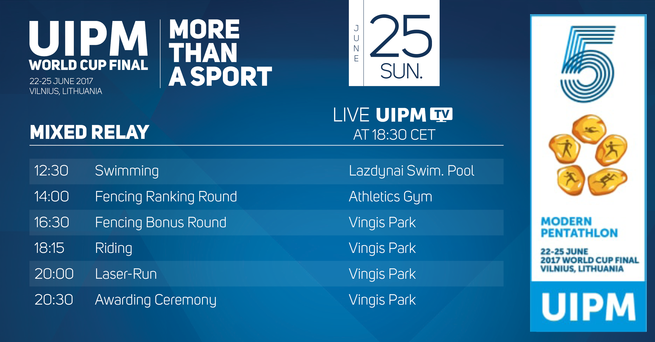 A live stream of the Laser-Run will also be available online at UIPM TV and the Olympic Channel from 6.30pm CEST.